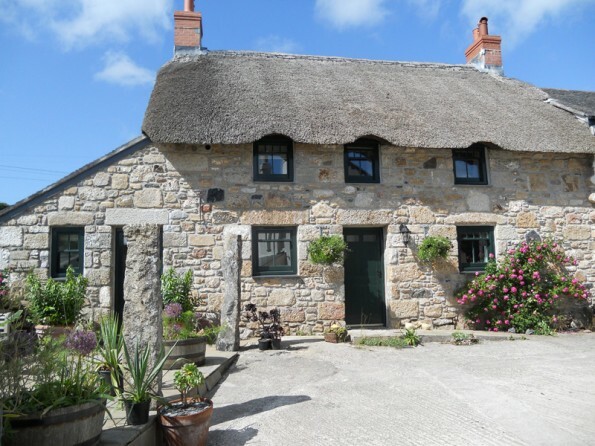 The cottage is located on the outskirts of Penzance in the West Penwith area of Cornwall, an area of outstanding natural beauty. 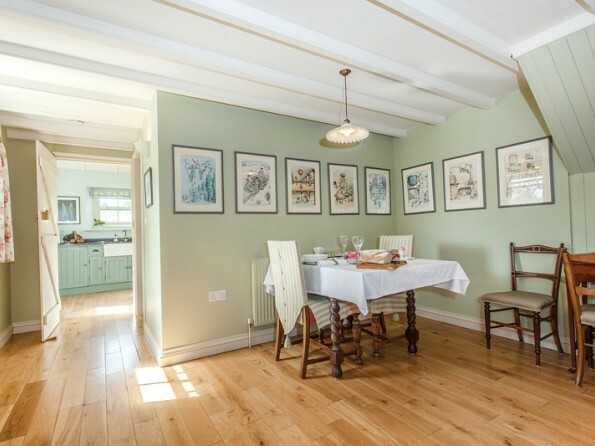 Visit some of the many beaches and coves to watch the surfers attempt to master the waves, or explore the farm and wallow in the comfort of these beautiful conversions. 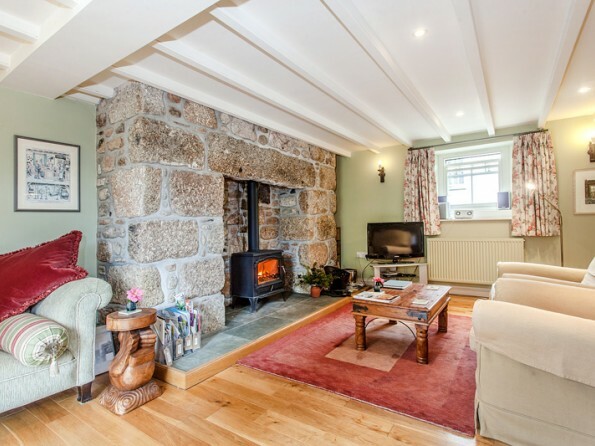 Here at Boscrowan, in Far West Cornwall, we have two award winning holiday cottages, each with its own unique character and charm. Both properties benefit from those special things that make any stay a holiday to remember. 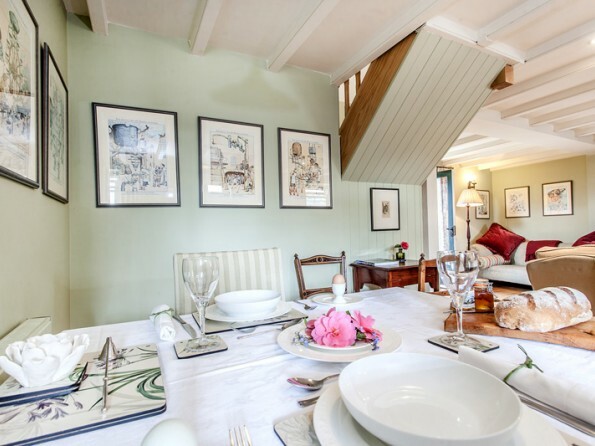 This includes the cream tea on arrival in the privacy of your own cottage, the local apple juice in the fridge, the freshly cut flowers and the high quality of soft furnishings and décor throughout. Imagine going on holiday to a property furnished in the way you would aspire to have your own, far from the office or the endless chores of our daily lives. That is why a stay at Boscrowan relaxes you the moment you arrive. Within walking distance of Boscrowan are the National Trust gardens at Trengwainton. Further afield, visit the gardens at Trebah, Trevarno, Trewithen, and Caerhays. For a special excursion, take a helicopter ride to Tresco, in the Scilly Isles, to visit the Abbey Gardens. And no holiday to Cornwall would be complete without a visit to the Eden Project and the Lost Gardens of Heligan. Inland, there are several ancient and pre-historic sites to visit. There are many quoits, including Lanyon Quoit, which is only a short distance away. There are castles to visit, including Pendennis and St Mawes, as well as the awe-inspiring Tintagel. 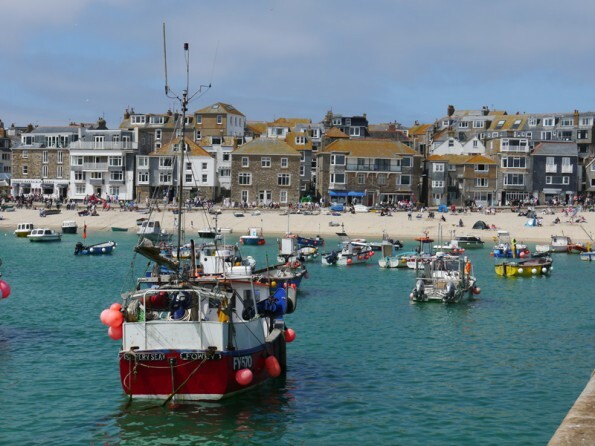 St Ives is a delightful town with a fabulous stretch of sand, and other places to visit include the Tate Gallery and the artist community. Penzance has a range of shops and lots of restaurants. Nearby, the fishing port of Newlyn is home to the largest fleet of fishing boats in the South of England. By train you should travel to Penzance. Boscrowan is approximately two miles from Penzance railway station, which is serviced from London Paddington. 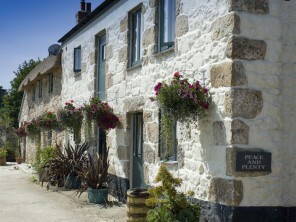 Boscrowan is also just two miles from Penzance bus station if you're coming by coach. If you're arriving by road, detailed driving directions will be provided on request. The nearest airport is Newquay. There are flights to Newquay from London Stansted and Gatwick, and from several other regional airports including Bristol, Cardiff, Edinburgh, Leeds/Bradford and Manchester. Boscrowan is approximately forty minutes drive by car from Newquay airport. 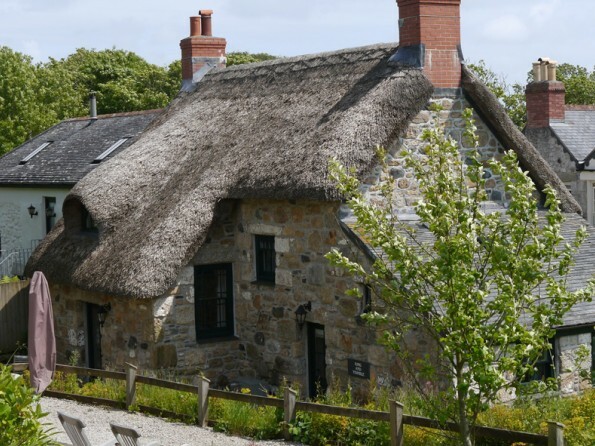 Ring & Thimble is a beautiful thatched cottage made just for two. 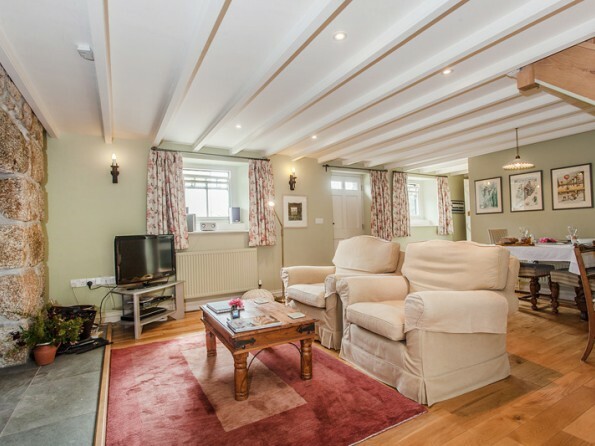 Purposefully spacious, the living area and bedroom offer very roomy and comfortable accommodation. 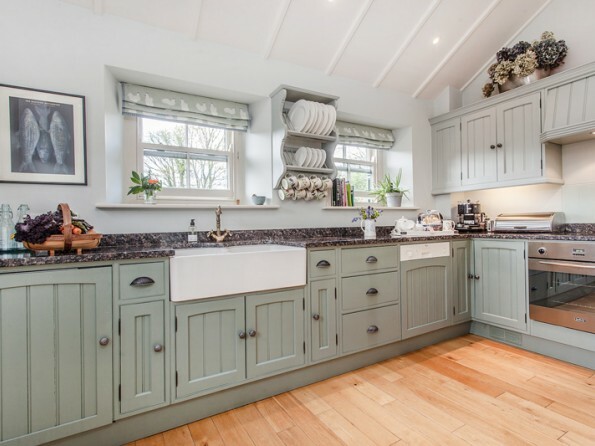 For those relaxing nights in, make full use of the beautiful bespoke wood kitchen with granite worktops and an oil fired Aga. Or curl up on the drop end Chesterfield sofa or comfortable armchairs in front of the multi fuel burner and watch TV or a DVD. French windows lead to the secluded brick-paved patio area with granite table and chairs. 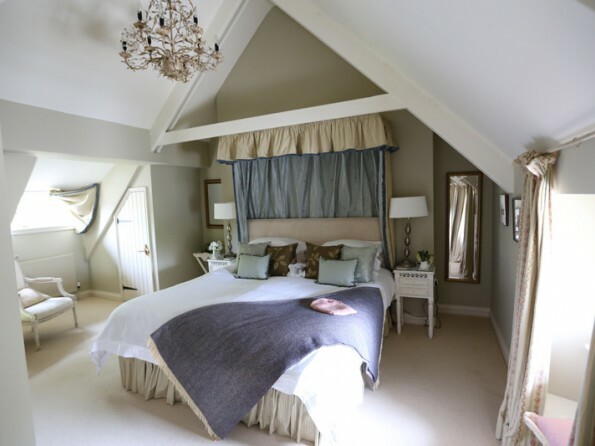 The ash staircase from the living area leads to the bedroom with a glittering chandelier above the half tester 6ft double bed with beautiful embroidered silk drapes, and there is even an area for sitting and contemplating at one end of the room! 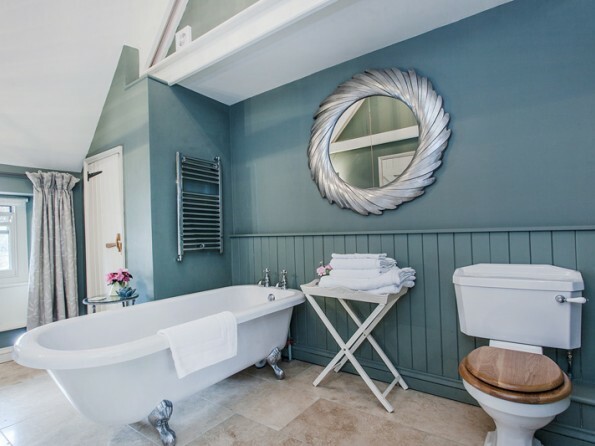 Across the landing is the bathroom with travertine floor, roll top bath, separate shower cubicle, wash basin and WC. The kitchen is well equipped and there is a separate utility room. 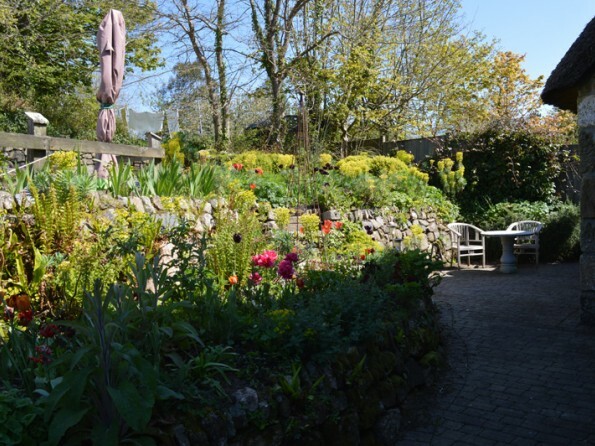 Outside there are landscaped gardens and a patio area with table and chairs for enjoying the Cornish weather. There are also two steamer chairs for relaxation. There is a small portable barbeque - ideal for taking to the beach and more environmentally friendly than a disposable barbeque - and there is also parking for two cars. 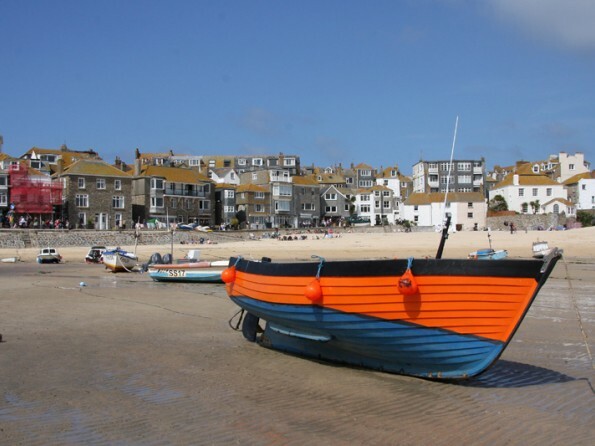 Fine examples of beaches are Porthcurno, Sennen Cove, St Ives and Marazion. From Marazion, visit the spectacular St Michael's Mount, which is an island twice a day and is reached by a causeway when the tide is out. Boscrowan is a 25 acre small holding, with mainly grassland and several acres of early daffodils. You are welcome to wander around our land. We do not have any commercial livestock, just horses, ducks, chickens and our two cats and collie dogs, all of whom are welcoming and friendly and respond well to a friendly pat or stroke. We suggest children come equipped with wellington boots to help collect eggs, feed the cats and dogs and in summer help us look after the chicks and ducklings. Many of our guests have returned year after year. We have won a number of Cornwall Tourism Awards, receiving a highly commended in 2002 and 2004, Bronze Awards in 2005 and 2006 and a Silver Award in 2008. 2009 saw our best year ever with a Gold in the Cornwall Tourism Awards and a second Gold in the South West England Tourism Excellence Awards. We also achieved Gold in the Green Tourism Business Scheme in both 2008 and 2009. Prices include electricity, oil for central heating and hot water, fuel for multi-burner, bed linen and towels. You may pay by cheque or bank transfer. Cheques should be made payable to D.R. and E.W. Harris. Your reservation will be held for 7 days to allow your cheque to arrive through the post. If paying by bank transfer, please telephone for details. Again, your reservation will be held for 7 days to allow for your transfer to arrive in our bank account. Short breaks may be available out of season for a minimum of two nights. Arrival/departure day is Saturday. The cottage is available to non-smokers only. Regret no pets allowed. No children under 16 at Ring & Thimble.